Despite claims that the president didn't go far enough, he at least told the truth, The Root's contributing editor Edward Wyckoff Williams writes at Ebony. Plus, he argues, the president strategically avoided an "angry black man" characterization. 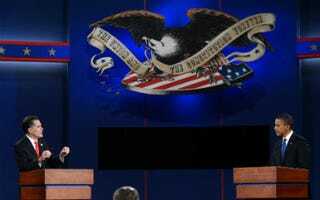 [The] first debate between President Obama and Republican nominee Mitt Romney may have disappointed the Washington chattering classes, as it was absent of a knockout punch by the incumbent or any well scripted zingers by the challenger. But one thing was abundantly clear: Romney's penchant for endless reinvention and flip-flopping, along with his lack of a political core, has not changed. The surprise that left many diehard Democrats and liberals scratching their heads was Obama's AWOL approach to Romney's most obvious liability: namely, the leaked tape of Mitt deriding 47 percent of Americans - claiming that his job is "to not worry about those people," because he could never "convince them to take personal responsibility or care for their lives." (Needless to say Romney's comments referred directly to veterans, senior citizens and much of his own Republican base: poor and working-class Whites.) The president also failed to mention Romney's refusal to release multiple years of tax returns, an issue that fueled debate for months over the candidate's foreign investments in the Cayman Islands and Switzerland, and whether Romney surreptitiously avoided paying taxes to the American government he now wishes to lead. Yes, on both these critical points President Obama was mute. But what critics may describe as the incumbent being 'off his game' may actually reveal a brilliant campaign strategy. The recent Drudge Report that sought to characterize (or caricature) the president as an 'angry Black man' is proof the GOP is still committed to Southern strategy style politics. Read Edward Wyckoff Williams' entire piece at Ebony.com.